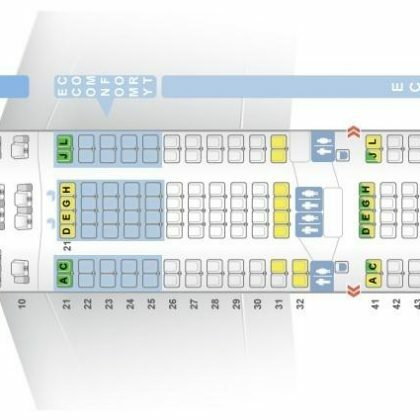 Seats in Airbus A321 are divided into two classes. Business class may transport 30 passengers. The seats in this class have 2-2 configuration. All middle seats, i.e. B and E seats are left empty. The seats 1A, 1C and 2D, 2F have extra legroom due to position of the bulkhead. However, close location to the galley may be bothersome. Also these seats have no floor storage during take-off and landing. The seats 2C and 2D are a little narrower than standard as the tray tables are in the armrests. Economy class includes 160 standard seats. The seats of the 9th row may have less space for passengers’ legs due to the bulkhead position. The seat 9A has no window. The seat 9E is 2 inches narrower than other seats on the airplane. 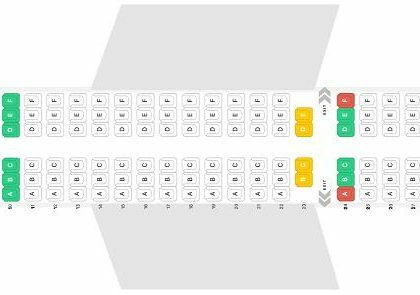 Two seats of the 10th row, 10E and 10F have extra legroom due to the exit row located in front. The seat 10F is missing window. The seats 11ABC and 11D are considered best seats as passengers of these seats will feel comfortable here thanks to extra legroom provided by exit row and missing seats in front. The width of the seat 11D is a little narrower as the tray table is in the armrest making it immovable. The seats of the 25th row are not reclining as behind them exit row is located. Passengers of the seats of 26th row will take advantage of extra legroom due to the emergency exit in front. As the tray tables are built-in the armrest the width of these seats is reduced a little. These seats also have no floor storage during take-off and landing. The seats 26A and 26F are missing windows. The seat 27D has also extra space for passenger’s legs due to the position of the crew seat in front. However, the width of this seat is reduced a little. The only disadvantage of the seats 36C, 36D and 37C, 37D is their close location to the lavatories. The seats of the last 38th row may be not reclining or have limited recline. Proximity to the lavatories and galley may be bothersome.